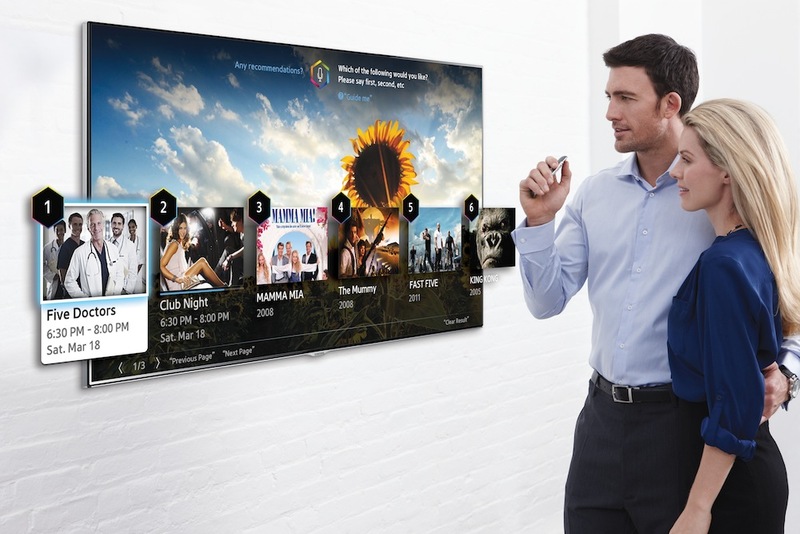 Samsung’s smart TVs are getting smarter next year. The Korean company announced today that it will showcase its 2014 Smart TV at the Consumer Electronics Show in January, which features improved voice interaction capability by focusing on the most frequently-used functions and taking usage patterns into consideration. Users can change their TV channel in one step by just saying the channel number, unlike Samsung’s 2013 Smart TV which requires a two-step channel change. When using voice interaction to search for information, a pop-up window appears on the bottom of the TV with search results, and users can move to the app and see the details. Other than voice interaction, Samsung’s 2014 Smart TV will see improved motion control via a new feature called the “finger gesture.” This means users can change the TV channel, adjust the volume, and search and pick what they want to watch just by using their fingers. They can also stop videos by simply moving their finger counterclockwise. The voice interaction service, which understands natural languages, will also expand into 12 new markets next year. It is currently available in 11 countries.